The game will feature maps set in Paris, Tehran, Sarajevo, Sulaymaniyah, New York, Wake Island andOman. As a whole, combat will take place in urban streets, metropolitan downtown areas, and open landscapes suited to vehicle combat. 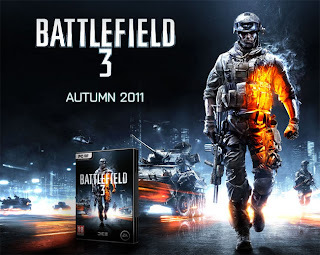 Battlefield 3 will introduce the Battlelog, a free cross-platform social service with built-in text and voice communicator, game statistics and ability to join the game that friend is already playing (both players need to be on the same platform). The campaign is set near the Iraq-Iran border, where the US Marine Corps is fighting the People's Liberation and Resistance (PLR). Battlefield 3 features the return of class-based game play, with four classes: Assault, Support, Engineer and Recon. Similar to "Battlefield 2142", the Assault class will be able to equip defibrillators and medkits. The mechanics of the light machine gun (LMG) have been changed to utilize the new engine. Bipods can be deployed anywhere when in the prone position or near suitable scenery, and provide a significant boost to accuracy and recoil reduction. Suppresive fire is an in-game mechanic which blurs the vision of those under fire from an LMG, and also reduces their accuracy. The Engineer will receive a flashlight that can be used to blind other players. Several game modes have been announced, including Conquest, Rush, and a new mode to the series, Team Deathmatch. A demo featuring the new co-op mode featured at Gamescom 2011. DICE GM Karl Magnus has confirmed that a split screen option will not be available in co-op mode. 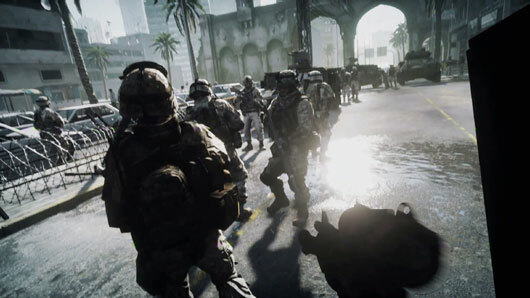 Battlefield 3's new Battlelog social network, DICE noted, would be tied to all co-op matches, allowing players to try to beat friends' scores and to track their performance. Server browser has been confirmed for console versions.